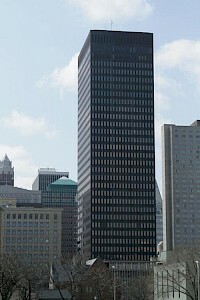 801 Grand, also known as The Principal Building, is a skyscraper located in Des Moines, Iowa. It is named after its street address, being located along Grand Avenue in the downtown area of the city between 8th & 9th Street (with High Street the northern border). 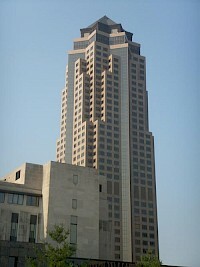 Completed in 1991 and standing at 630 ft (192 m) it is currently the tallest building in the state of Iowa. It is also the second tallest building between Minneapolis and Denver after the First National Bank Tower in Omaha at 633 ft. The Observatory Building, also known as the Van Ginkle Building, was a skyscraper located in downtown Des Moines, Iowa. Standing at 197 ft tall (60 m) and heralded as "the tallest office building between Chicago and San Francisco" when opened on April 1, 1896, it was also the first skyscraper in Iowa. Although it was the tallest office building, the Observatory Building was not the tallest building in Des Moines, the Iowa State Capitol, completed in 1884, was 275 ft tall (84 m). The Ruan Center is a skyscraper located in Des Moines, Iowa. It was built by Ruan Transportation and is located along Grand Avenue in the downtown area of the city. Completed in 1975 and standing at 460 ft (140m), it was the tallest building in Iowa until the completion of 801 Grand in 1991 and is currently the second tallest. 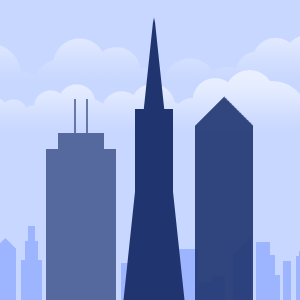 The Ruan Center is locally famous as the "rusty skyscraper", for its Cor-Ten steel cladding that sheds rust.